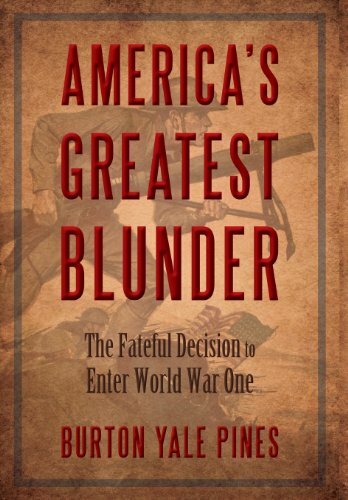 Despite being a fairly well-read student of US history, I admit that I’ve not been well versed in the complex events and details surrounding World War I. Burt Pines has helped me out, with his excellent book and its compelling and unsettling conclusions. But, first I’ve several comments “in the interest of full disclosure,” as the phrase goes. I know Burt, and he was my boss long ago, in the early 1980s, when I had my first “real” job after completing college and a stint in Korea as a Peace Corps Volunteer. As a policy analyst in the Asia division of a major Washington, DC “think tank”, Burt supervised me and, most notably, edited all of my writings there. With his background as a seasoned journalist and national magazine editor, he was an aggressive taskmaster and a tough editor! I learned a lot about writing, and policy and history analyses, through Burt’s guidance and critique of my work. I consider myself a much better writer and analyst, as a result. Thanks, Burt! Through 1917, Wilson finessed an 180-degree pirouette and turned the nation toward war against Germany. Burt lays out the complicated scene, with the British in particular conducting very clever, successful and, at times, devious propaganda campaigns in the US aimed at whipping up American sympathy for the Allies. Despite the fact that German-Americans were a huge and potentially potent interest group in the US, Burt maintains that Berlin was feckless in making its case to the American people. It didn’t help that American merchant ships occasionally were being attacked, and trade with Europe was being disrupted. Still, regarding this turbulence in the Atlantic, Burt explains that blame for that should be shared by both England and Germany. But, once they were tainted with the exaggerated reputation as “brutal Huns”, the Germans were the target of most Americans’ wrath by the eve of US entry into the war. Perhaps most damning, Burt explains that Wilson threw the nation into Europe’s war at the worst possible moment. While Congress declared war in April 1917, substantial numbers of US “boots on the ground” were not in place until well into 1918. By that time, Burt convincingly contends, the British and French, on the one side, and Germany on the other were battered and exhausted. Absent US entry, could the allies have won? Burt concludes “no”. Absent US involvement, might Germany have been the victor? “No”, Burt believes. Rather, the European combatants were on the verge of throwing in respective towels and calling for negotiations leading to some reasoned political compromise. 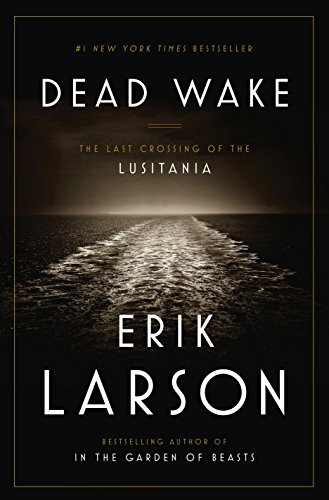 Dead Wake: The Last Cr... Erik Larson Check Amazon for Pricing. But, by mid-1918, hundreds of thousands of US “doughboys” were amassing in European staging areas and preparing to enter the fray in massive force. This prompted Germany to make two final, massive, bloody and failed thrusts against the Allies, hoping to prevail before the Americans were fully engaged. So, Burt maintains that Wilson’s flip-flop and the nation’s World War I entry worsened the violence and led to a lop-sided Allied victory rather than any semblance of a balanced, stable political settlement. Congratulations on contributing this insightful and interesting book to the annals of American history, Burt!